A sample of the cosmetic changes to the Regional Trip Planner. 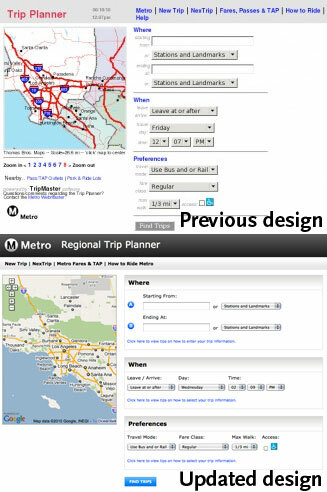 Metro has begun to implement changes to the online Regional Trip Planner – namely an updated design and Google Maps integration. The visual design has been updated to match the look and feel of the redesigned Metro.net website, the language has been updated to be more user-friendly to first time riders and the addition of Google Maps provides much improved visuals and functionality. This September the Trip Planner provided 5,392,130 trip itineraries. The Trip Planner has scheduling data for 70 Southern California transit carriers. The Trip Planner was first introduced in 1999. The changes are live, and you can check out the updated Regional Trip Planner now. Plans are in the works for future improvements to the software – let us know how you feel about the recent updates and what you’d like to see in the future by leaving a comment. Finally! It was laughably outdated and incredibly difficult to work with. I can’t wait to see this finished. They should try and work on the search parameters too – the provided options often don’t correspond to what the user entered. Thanks for your feedback Carl, we’ll pass it on to the Metro web team.